These adorable cupcakes look like little Santa hats and we can’t get enough of them here at Organic Times. Your wonderfully crafted Snow Cupcakes would be perfect for the work Christmas party or the end of year school function. You are sure to have none left at the end! 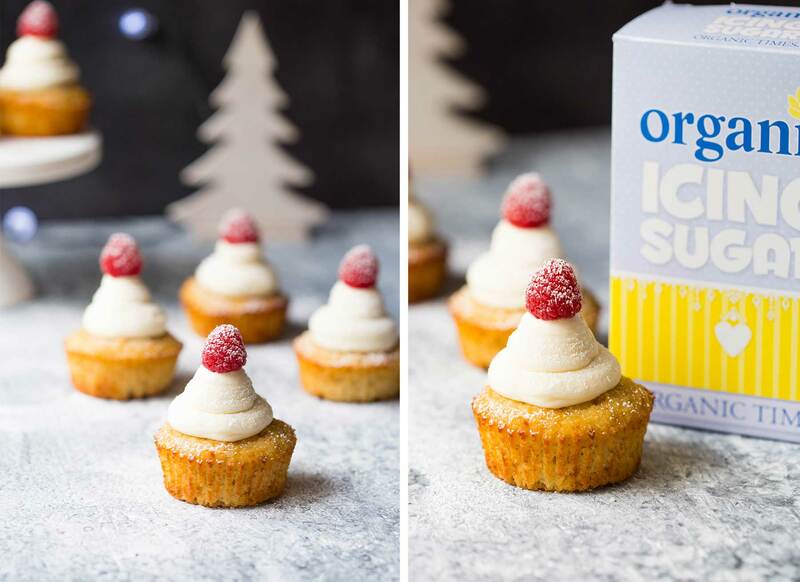 Snow Christmas cupcakes are gluten free using our organically sourced Coconut Flour and paired with a delicious white chocolate, snow icing frosting. Preheat oven to 180ºC (356ºF) and line a cupcake pan with patty liners. In a large mixing bowl, combine coconut flour, baking powder and salt together. In a separate mixing bowl, whisk together eggs, honey, coconut oil, milk and vanilla until smooth. Add dry mixture into wet, mix until well combined. Divide the batter evenly among the cupcake patties. Filling them 3/4 of the way full. Bake for 18-20 minutes or until golden and a toothpick inserted into the middle comes out clean. Cool in pan for 10mins. In a double boiler over low-medium heat, melt white chocolate, stirring occasionally. Once completely melted, turn off heat, set aside. Between additions of icing sugar, add milk, 1 tablespoon at a time. Add melted white chocolate and beat mixture for a further 1-2 minutes or until light and fluffy. Once cupcakes have completely cooled, pipe frosting, using a size 7 round piping tip. Place one raspberry on each cupcake. Cupcakes will keep in an airtight container, refrigerated or in the pantry, for up to 4 - 6 days. Add raspberries when serving cupcakes straight away. This will ensure the raspberries do not melt into the frosting.